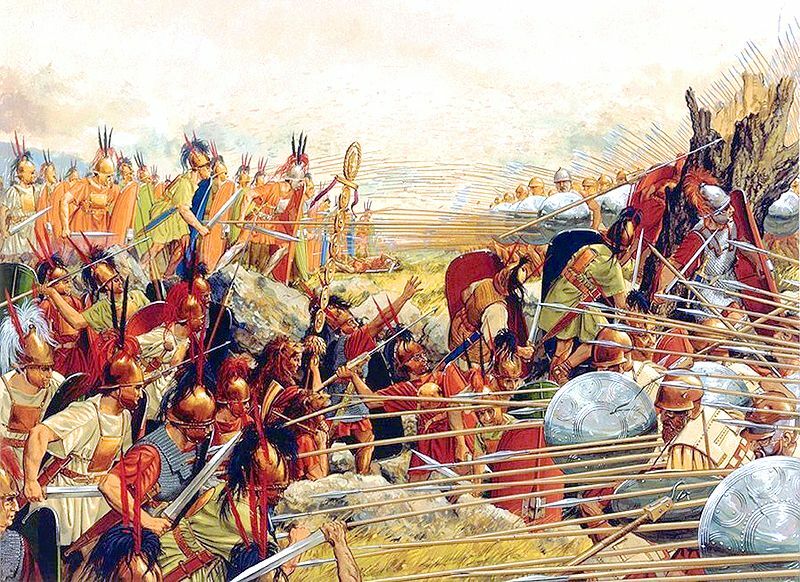 A reconstruction of the battle of Pydna, by Peter Connolly, demonstrating how the broken ground disrupted the Macedonian phalanx, allowing the Romans to close with the phalangites and use their superior swordsmanship to good effect. 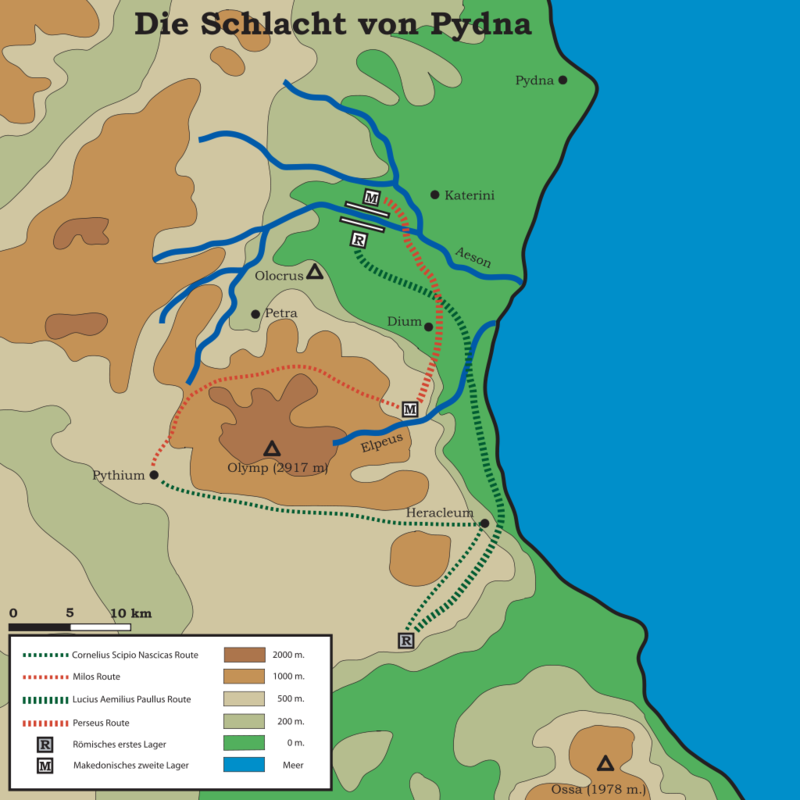 We do not know why the battle of Pydna finally began. In one tradition Aemilius Paullus sat in his tent waiting for the sun to decline into the west, so that it would shine in the eyes of the Macedonians. When the time was right he brought on the battle with the ruse of having the Romans pursue a runaway horse toward the Macedonian lines. In another version, Paullus did not wish to fight at all that day because he was waiting for his foragers to return, and the battle began accidentally as the result of a skirmish between drawers of water. But this we know: the Roman army deployed in the conventional manipular formation and fought Perseus’s phalanx nose to nose on the plain. And, predictably, the Romans began to lose. When the Romans met the Macedonian phalanx the spears of the Macedonians pushed them steadily back: “At the onset, Aemilius arrived and discovered that the Macedonian units had already planted the tips of their sarissas in the shields of the Romans, who could therefore not get forward and reach them with their swords. And when he saw the rest of the Macedonians drawing their shields around front of their shoulders [in preparation for combat], and that the sarissas leveled at a single signal were withstanding his shield-armed soldiers, and when he saw the strength of the locked-shield formation and the harshness of the attack, astonishment and terror seized him, because he had never seen a sight more fearful. And later he often used to recall his emotion and what he saw.” The Romans were driven to extremities to break the Macedonian formation and stop the relentless pressure. The commander of a contingent of Rome’s Pelignian allies cast his soldiers’ standard into the midst of the phalanx, and the Pelignians tried heroically to thrust the Macedonian spears aside—with swords, shields, even their bare hands —to recover it. But to no avail. The Romans were soon in full retreat. Aemilius Paullus rent his garments in despair. Why Aemilius Paullus was willing to fight a frontal battle with Perseus’s phalanx is a mystery. Plutarch attributes to Paullus awareness of the special dangers presented by fighting the Macedonian phalanx: and well might he have been. The Romans had been fighting the Macedonian phalanx for more than a century. Pyrrhus defeated the Romans with it in the early third century, the Carthaginians in Africa in the middle of the century did as well, and Hannibal did the same later. In 197 bc the Romans had won a terrifying victory against Perseus’s father at Cynoscephalae, a battle that vividly illustrated the terrible power of the phalanx’s charge, even on unsuitable ground. In the year before Cynoscephalae, the Roman siege of Atrax had failed when a Macedonian phalanx drawn up in a breach in the wall had proved quite impervious to Roman attack. Polybius’s judgment that “when the phalanx has its characteristic virtue and strength nothing can sustain its frontal attack or withstand the charge” will have been no news to Roman commanders. The phalanx’s fatal flaw, Polybius says, is that it requires flat terrain so that it can preserve its close order. Perseus’s father’s unwise decision to fight on broken ground allowed the Romans to defeat him at Cynoscephalae. But Aemilius Paullus consented to fight the Macedonian phalanx on a plain, ideally suited to it, on ground that Perseus had chosen for exactly that reason. There was nothing in Aemilius Paullus’s record to suggest he was rash or inept: quite the opposite. When campaigning in Spain, he had chosen his battlefields with a careful eye toward advantage. Later he had defeated the Ligurians with a complicated stratagem, issuing forth from a besieged camp from all gates at once to catch the enemy by surprise, here carefully having the hastati of one legion lead the charge, there the principes of another. After his victory over Perseus men remarked on the careful preparations Paullus made for throwing dinners in Greece, and the Roman general joked that he took as much care over ordering dinners as he did in marshaling a line of battle: a remark that loses its force unless he was thought an especially careful tactician. “A really good general,” Paullus was apt to tell his own son, “does not commit to a pitched battle at all, except in cases of the greatest necessity or the greatest advantage.” Neither was the case at Pydna. The outlook, past conduct, and behavior of Aemilius Paullus in the days before Pydna—his feints and ruses on the Elpeus—place him squarely in the Roman tradition of crafty, strategy- and tactics-minded generals, in the tradition of Fabius Maximus and the great Scipio Africanus. Rome was old in the use of tactics: there is no reason to suppose there was ever a generation of Roman fighting without tactics, any more than there was in Greece. Guile in war was as ancient as Roman legend: in the fabled duel of the brothers Horatii, the surviving brother overcame the Curatii by the trick of false flight. At the very first Roman land battle of which there is a reliable, detailed account, Bagradas River in 255 bc in the First Punic War, the Romans are already found varying the standard manipular deployment in the hope of gaining a tactical advantage. 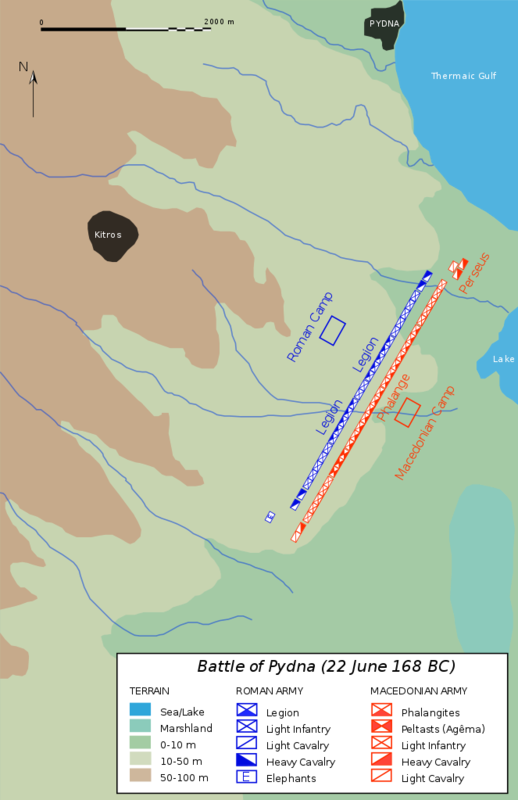 By the Second Punic War and the early second century, commanders like Scipio Africanus managed to adapt the many moving parts of the manipular legion to sophisticated tactical battle plans: varying the checkerboard disposition of the maniples, deepening the array, wheeling the array, using the lines of hastati, principes, and triarii independently, detaching maniples to flank the enemy, deploying a second line of legions as a reserve, and approaching the enemy in a battle-ready marching formation. Other sections too of the Roman army were creatively exploited by tactical Roman commanders. Cavalry made flank attacks, and the velites were detached from their legions and used as independent forces of light infantry. Such tactics played a crucial role in defeating Carthage and featured largely in the great victories of Scipio Africanus at Ilipa in Spain in 206 bc and Zama in North Africa in 202. Cato’s battle of Emporiae in Spain in 195 may display the most complicated Roman tactics of all in this period. Although tactics were native at Rome, by the late third and second century bc there is clear evidence of Greek influence on Roman generalship and methods of fighting. Scipio, we are told, was a keen reader of Xenophon’s Cyropaedia, a work in which the Greek expert offered in Persian guise his proposals for Greek military reform. By Paullus’s day Roman cavalry equipment had been reformed on the Greek model. The Romans had also begun actively seeking out specialist Greek troops, like the archers from Crete, rather than merely using them when sent by their allies. Elephants too were part of an integrated Hellenistic army. A force of them had been brought from Africa at the beginning of the war against Perseus, and Aemilius used them at Pydna. Thirty years before, Flamininus had used elephants to fight Philip V at Cynoscephalae. The Romans may have learned more about elephants from fighting Carthaginians than from reading Greek manuals, but this was Greek doctrine at second hand: the army of Carthage was modeled on Greek armies, and Hannibal himself was a Hellenized commander. Now the Romans were using Greek stratagems; now the Romans knew Greek lore like the path around the back of the pass at Thermopylae. Now Romans could be imagined debating questions like, Who is the greatest general of all time?—questions that implied that some of them at least had come to share the Greek conception of generalship as a competition in technical expertise. Greek influence on Roman command is hardly surprising: it is merely a small instance of the gigantic phenomenon of the Hellenization of the Roman aristocracy in the late third and second centuries bc. This cultural transformation affected nearly every aspect of upper-class Roman existence —from education and language to entertainment, decoration, clothing, and housewares. And many of Rome’s tactically minded commanders were leaders of the philhellenic movement, Scipio Africanus (Hannibal’s foe) and Aemilius Paullus among them. After his victory over Perseus, the Greek-speaking Paullus took a long tour of famous sites in Greece and offered Greek athletic games. He gave the Macedonian royal library to his sons. When Paullus made his grim way home after being appointed to fight the Macedonian king, he found his small daughter in tears. Her little dog Perseus had died. “Good fortune, my daughter! I accept the omen!” crowed the consul (how his weeping daughter greeted his glee is not recorded). But a dog named for a Greek hero is also a small yapping sign of how pervasive Greek influence on Rome had become. When we see Paullus not only employing military tricks and ruses, but also applying natural science to war—geology to dig wells, astronomy to reassure his men—we can be certain that he was up to date with the most advanced trends in Greek generalship. Yet cerebral generalship was strongly resisted at Rome. Trickery and tactics, as the old senators had complained when the envoys reported the lies they had told to Perseus, could be viewed as opposed to virtus. “Among the Romans, a bit of a trace of the old philosophy of war is left,” wrote Polybius of the Romans of Aemilius Paullus’s day. “They declare war openly, rarely use ambushes, and fight their battles hand-to-hand at close quarters.” Many Romans preferred a battle, as Livy put it, “with standards set against standards, on a clean and open field, where without fear of ambush the affair could be settled by true virtus.” The general, in this view, was to lead the army directly at the enemy, to allow his soldiers to display their virtus, and to display his own. After a loss a Roman general might be prosecuted for personal cowardice, but not for tactical stupidity. Terentius Varro, the aggressive consul who committed the Roman army to the disaster at Cannae, was not punished for his bad planning but thanked when he returned to Rome for “not despairing of the Republic.” It was far more important to the Romans that their generals be plucky and adventuresome than that they be skillful strategists and tacticians. This entry was posted in Ancient Warfare, Battle, Roman by MSW. Bookmark the permalink.